Dover Youth to Youth started during the 1992-93 school year. The Dover Police Department was the hosting and sponsoring agency that started the program. The DPD was looking for a youth-element to its expanding community policing program and wanted to also build up its drug prevention effort beyond simply doing DARE. At the time it was hoped that a program of 20-25 students could be created that would conduct some programs to help the police department promote a drug free message. Dover Y2Y started small, just 11 girls and one boy signed up the first year – all in sixth grade at the Dover Middle School. In year 2 and 3, the group expanded to about 20 members and began to develop an array of projects and short skits it could present at events. Starting in year 4 the Y2Y students performed a humorous, in-your-face skit at DARE graduation for the 5th graders, followed by a direct appeal by the students to the audience to join Y2Y when they become 6th graders the following year. This one of several short skits the group has created over the years. That exposure produced immediate results. The following year, membership in the program tripled and continued to grow for the next few years until it peaked at over 200 students in 1998-2000. Over the years Dover Y2Y has become nationally recognized for its capacity to develop leadership and life skills in its members, while impacting their environment. As the program grew, Y2Y students began aggressively planning substance abuse related Community Awareness projects and activities in and around Dover. This included many school and community projects with a positive message like the Gear Exchange or Plaster the Walls. It also included larger projects like the protest taking on a local “head shop” or challenging a retailer at the mall for selling merchandise glorifying drug use in the Spencer Gifts Project. The latter project effectively got the students kicked out of the mall for being against drugs. The students also became proficient at planning longer running more sophisticated Comprehensive Campaigns that brought a targeted message to the region using multiple methods to convey that message. An example of that is the 2009 – 2013 Fridge Campaign to get parents to be more careful about the alcohol stored in their home to reduce the access of alcohol for younger kids. In 1996 Dover Youth to Youth wrote and recorded its first radio spot/public service announcement (PSA). The anti-tobacco PSA was recorded in the studios at radio station WOKQ and started a relationship with that business that continues to this day. WOKQ has allowed us to use their recording studios to produce all of our PSAs. 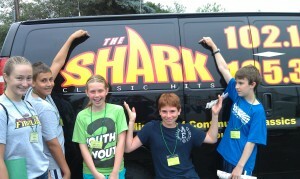 Typically, Youth to Youth records 6-8 new Radio PSAs each year. Youth to Youth made its first broadcast quality video PSA called Breaking Up in 2013. It played that winter on WMUR Channel 9 several times – as well as at least 100 plays on regional cable channels. Youth to Youth has developed several multi-media presentations & training programs which have been taught locally in our region and in 19 states all over the US. In 2003 Y2Y made the first of 3 trips to Bermuda after being invited to teach in the schools all over the island. Dover Y2Y conducted its first workshop presentation at a major national conference in 1998 when it was invited to present at the National Crime Prevention Conference in Orlando. Since then, Youth to Youth students have presented continuously at a variety of major conferences across the United States, including: 2 trips to the TREND Conference in St. Louis, 3 PRIDE Conferences, 3 times at CADCA in Washington, DC, 4 times at the national tobacco conference and 5 times at the National Leadership Conference on Underage Drinking. In 2000, Y2Y proposed and passed its first piece of state legislation. As a result of its Zig Zag Project, Y2Y was able to get a state law passed that had the effect of making it illegal to sell rolling papers to kids or for kids to posses them. Since then it has passed several Dover City ordinances and two other state laws – one to make it illegal to host an underage drinking party and one that requires cigarettes to be self-extinguishing if put down. Dover Y2Y had always communicated with and shared resources or provided training for other youth groups taking on the drug problem. In late 2008, Dover Y2Y was advised that ONE Voice for Southeastern New Hampshire (Region F of New Hampshire’s Strategic Prevention Framework) had chosen Dover’s youth empowerment model as a core strategy. In January 2009 the region officially got the go-ahead to implement their plan to establish youth empowerment groups in interested high schools in the region. 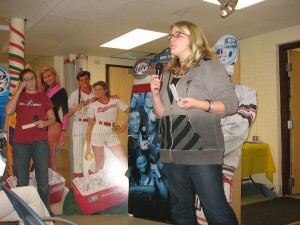 The program was expanded to middle schools the following year. To facilitate this more structured effort to replicate the Youth to Youth program – we combined all of our work product and prevention materials into a single manual that was named the One Voice Youth Empowerment Toolkit. Almost immediately the Toolkit went to a second printing as other communities requested to purchase a set as a resource for their program. Since 2009, the Youth to Youth program in Dover has been engaged in a process to allow its widely recognized youth empowerment program to be scientifically evaluated to determine the actual impact of the program on teens. In 2010 Dover Youth to Youth was selected for advanced assistance by the US Substance Abuse and Mental Health Services Administration (SAMSHA) Service to Science Program. This assistance included expert technical assistance in how to design and conduct the research. 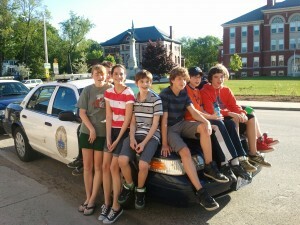 In 2011, Y2Y was selected to receive one of only fifteen $30,000 SAMSHA evaluation grants awarded nationally that year. The One Voice Youth Empowerment Model was endorsed in 2013 by the State of New Hampshire Center for Excellence as an Evidence-Based Program after review by an expert panel. To read more visit Research and Evaluation. As a result, Dover Youth to Youth’s empowerment model will be listed on the NH Registry of Evidence-Based Interventions (NH-REI) and certified as a program shown to be effective.